The app update of Facebook for iPad and iPhone which was originally scheduled to be rolled out in July is finally here in app store with various improvements than its predecessor that was deemed to be much slower and puzzled with errors. Facebook, it seems has taken its own sweet time for bringing out this important update for the iPads and iPhones along with iPod touch. Fortunately, Facebook didn’t disappoint us because of various reasons such as faster loading of pages, application not crashing and user interface zips. So finally we all got to see the well lubricated and fully functional Facebook app for the iOS. The major update by Facebook has added the much required speed to the iOS which was initially a clunky as well as slower experience. The new application has done away with the HTML 5 which compelled its previous version to top off the new data whenever you opened it. Now with the better speed, the application runs pretty natively on the iPad and iPhone. You can say that the speed is two times faster than before. This means that scrolling through news feed is smoother than before. 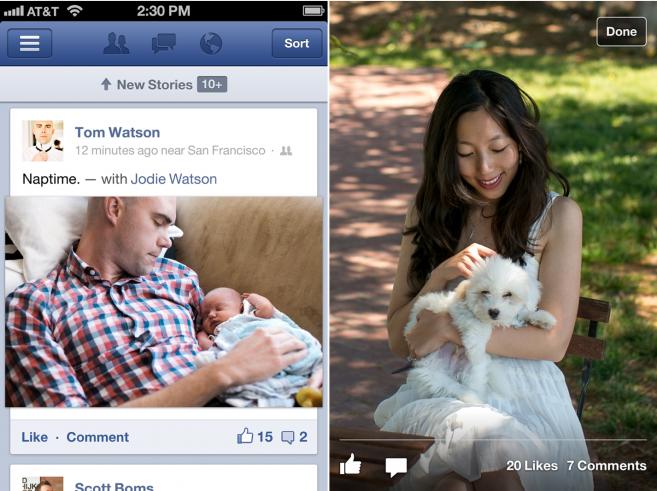 The new update allows you to get the instant updates whether on the photos or on the statuses. All the credit goes to the new option which sits at the top most area of news feed. This allows for easier and better photo updates and that too at an improved speed. The new Facebook app is exactly what we all wanted- the ne supercharged application! It means that as soon as someone will like or comment on your photograph, it will show up in the real time. You don’t need to refresh it time and again. Facebook also advertises its new features or rather a few buttons. There is a very neat New Story button at the top of News feed. This allows you to get the news stories easily. Initially refreshing took a lot of time and sometimes it remained unaffected too. But now with the new updates, refreshing is actually not required at all. It is easy to find the new “stuff” that your friends have posted on the Facebook. Another interesting feature is the quick swipe that can be used to close the photos. This works like fluid on your iPad or iPhone. So, apart from loading faster the photos are also closing faster! A quick notification is something that Facebook has introduced too. You don’t need to sit and wait for getting the notifications because these will be available as soon as sometime does an act on your profile. Honestly speaking, it is quite nice to see Facebook with all such updates because this was the need of an hour! As far as the iOS is concerned, Facebook has indeed done a commendable job here. It might deteriorate in the near future, but as of now this is exactly what you need for your iPhone and iPad!